Beverly Serrell’s workshops will show you how to create exhibitions that will engage visitors in personally meaningful ways. Each workshop is designed to be a comprehensive stand-alone learning experience. And when taken in any sequence, the five build upon each other: Good labels are driven by what we know about how visitors use informal designed settings—by watching and listening to visitors and understanding the affordances of those settings—and are faithful to and bounded by the main thesis of an exhibition. How can labels for museum exhibitions be engaging, interesting, and neither too long nor too simple? 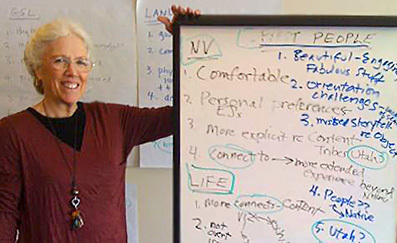 Learn how to write and edit interpretive texts that will appeal to a broad audience, based on the assumptions that most museum visitors are interested and are motivated to learn, but typically have limited prior knowledge or vocabulary about the topic, not to mention a limited amount of time to spend. One-day label-writing workshops cover the essentials of writing engaging interpretation to increase the educational potential of exhibitions. 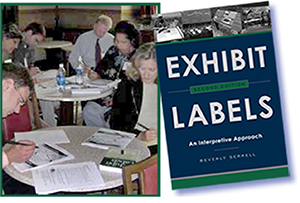 Experienced label writers will obtain new tools and attitudes for their approaches, and those with no experience will learn the basics for getting started on the right track. 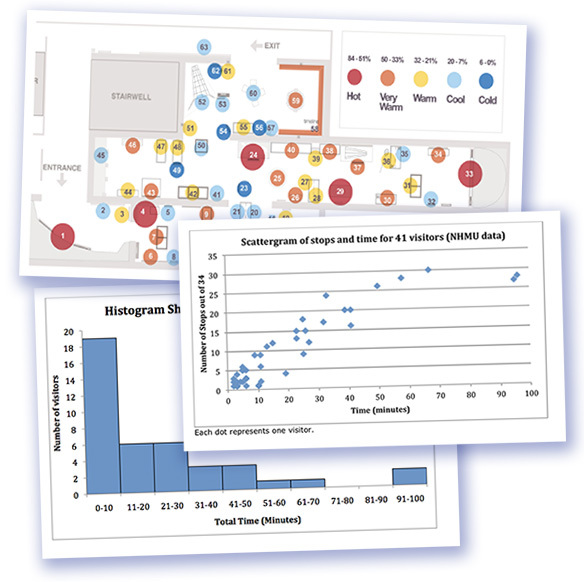 How can exhibits be improved? What have we learned over the years? This workshop summarizes what visitor studies have revealed about visitor behavior in exhibitions and what the conclusions and implications of the data are. Recommended for museum professionals who are in the process of renovating an old exhibition or planning a new one. In both the half-day and full-day sessions, participants will review theories and data from visitor studies and learn how the findings can improve visitors' experiences. In addition to taking a close look at data presented in charts, graphics, transcripts, and reports, participants will apply the findings to their own exhibitions. A transformational experience! 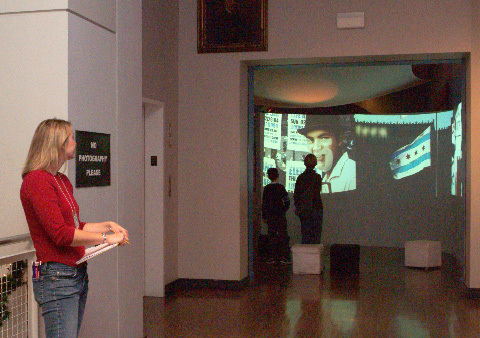 Tracking and timing is one of the most basic methods of studying visitors in museum exhibitions and is one of the best ways to better understand how people use informal learning environments. Participants will gain a working knowledge of this method and will practice gathering data in a real exhibition. The findings will be compared to the database of other T&T studies. Seeing and doing T&T for themselves helps all museum professionals gain empathy toward visitors, which can lead to positive changes in making their institution more visitor-centered. This workshop can be done with participants from different museums or staff members from one organization. Recommended for museum students as well as emerging and long-time professionals. 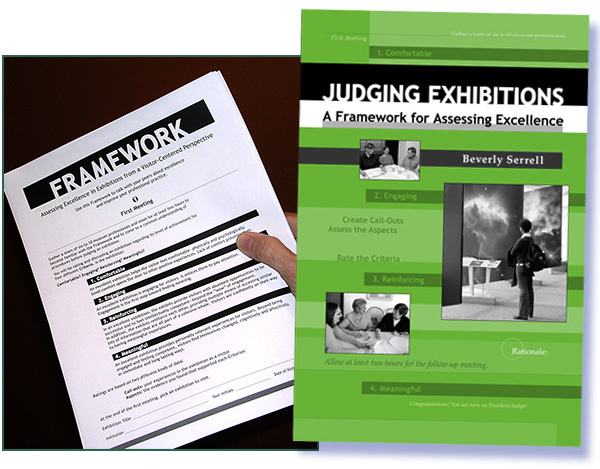 This workshop is based on the book Judging Exhibitions: A Framework for Assessing Excellence. The activities outlined in the Framework (download a copy of the tool) can be self-directed, but participants who are part of a workshop led by an experienced "EJ" will benefit from a more structured and rigorous experience. Taking part in all phases of the Framework's activities requires a minimum of four hours, and would be less rushed at six, to allow time for important and in-depth discussions. Familiarity with the criteria and aspects of judging an existing exhibition is a natural prelude to using the Framework as a planning tool. Every exhibition needs a clear thesis statement. 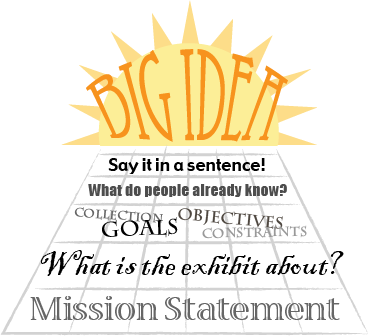 The Big Idea workshop starts with the definition of and rationale for using a big idea to develop an exhibition. We review and judge a selection of examples from many sources for their degree of adherence to the definition and for their apparent usefulness. Case studies of how big ideas have evolved are examined, and we discuss the difference between big ideas, themes, topic outlines, communication goals, and behavioral objectives. For museums that are currently developing an exhibition, the Big Idea workshops usually take place over two half-days: the afternoon of the first day, and the morning of the second day. This overnight break is essential for the process of reflection and contemplation needed to come up with a satisfactory concept. Workshops given at museum professionals meetings usually last one full day. 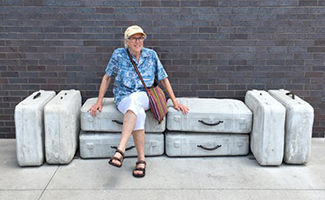 Beverly Serrell has conducted Big Idea workshops for all types of museums and for museum professional organizations. Excited? Want to Sign Up? For consulting fees, upcoming dates, directions for scheduling a workshop, what’s included (materials, travel expenses), or questions, go to Contact.